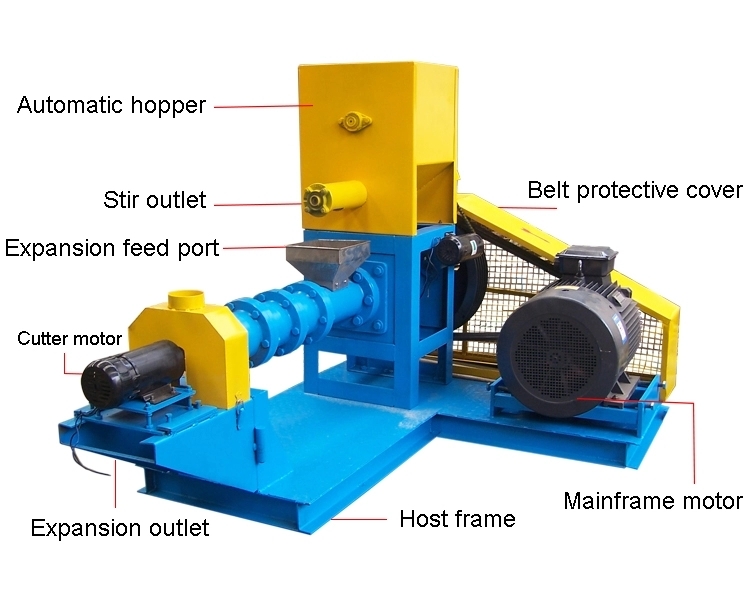 Dry type floating fish pellet machine, also called fish feed pellet mill, is widely used for producing variety materials into high-grade aquatic feed pellets for fish, catfish, shrimps, crab etc. The final feed pellets have unique shape and good taste, high nutrition and smooth textures. For feeds of fish and shrimp, the floating time on water surface can be adjusted by the extrusion degree adjustment when extruding the pellets. Currently, floating fish pellet mill has become an ideal for small and medium fish farm (catfish, tilapia, shrimp etc.) holders or fish feed processing plant. There is no need to heat outside the floating fish pellet machine, through the screw extruding of the raw material, heat is produced and gathered during the rotary working process in the airtight environment, and during the high temperature ripening process, the starch and fiber of the raw material become swell. Then under the pressure-tight condition, material will be formed into pellets by shaping mould. At the end, through the high pressure produced by the regular rotating of the screw, after being cut by the forepart cutter which rotates regularly and high-speedily, the finished products will be shrunk and become small average puffed balls in room temperature and pressure. 2. Observe how fish respond to feeding and portion the feed appropriately. Low consumption may be a sign of disease or deteriorating water quality. 5. Keeping farm management record helps fish farmers to control cost and select the right management approach. It helps to detect potential disease outbreaks at an early stage.